Oh, polka dots. Oh, stripes. I love you both equally. Don't make me choose! We can make this work! Just a couple days left to enter the Mochi Beaucoup giveaway. Quick! Go enter! Oh, this is just CUTE! I love how the polka dot collar peeks out of the striped sweater. gorgeous mixture of patterns and bag!! love everything so much!! Hi! 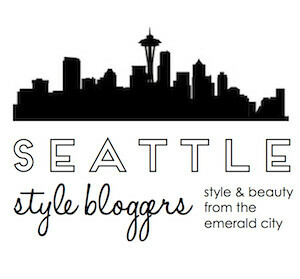 I just found your blog via fb, I'm also a Seattle blogger. Decided to follow you after reading your last ten posts or so. Also love the snow street photo with the yellow street lights. Hope you'll check out my blog! Thanks! i love mixing dots with stripes too! u look cute in this outfit! Stripes and spots are my favourite prints ever. I love to mix them! This is SO cute! 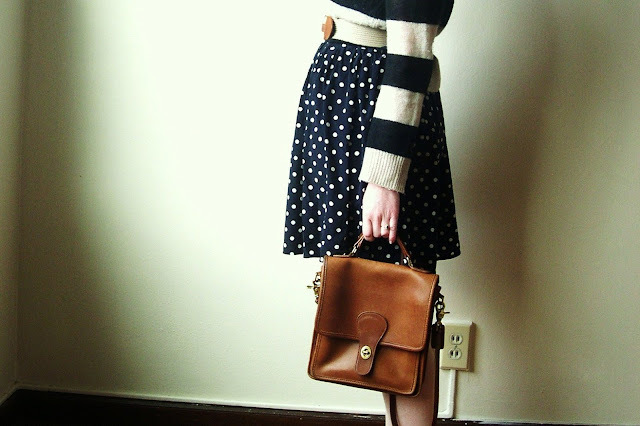 I love polkadots and stripes together. I think they were just meant to be! The the polka dot and stipe combo! Looking good! Just a heads up this is actually a vintage Coach station bag :) The Willis is a different larger style. Super cute either way!